I have another question about e-mail that was not answered here. How can I get additional help? What is "My PenTeleData Webmail"? 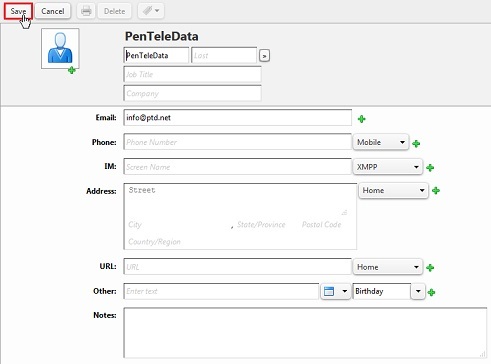 What are some of the features of the newest "My PenTeleData Webmail"? Will the new version of "My PenTeleData Webmail" have the option to create message rules or filters to avoid SPAM from reaching my inbox? 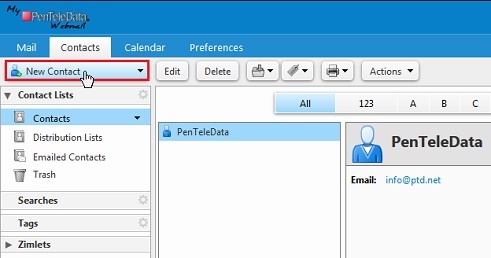 How do I access "My PenTeleData Webmail"? Can I still send attachments? You can call our Technical Support Department to speak with a technician. Technical Support will attempt to answer any questions related to email that were not covered here. No. All PenTeleData email boxes include a complimentary 5 GB of free email storage. If you exceed your complimentary 5 GB of email storage, all new inbound email will be returned to the sender. For more information on your email Storage Space. "My PenTeleData Webmail" is a web based email client giving you the ability to check your email at anytime with any Internet connection. Whether on vacation or at home, you can access your email at anytime, as long as it was not already downloaded using an email client. Yes, you will be able to create message filters to have message(s) tagged as ***SPAMTAGPTD moved directly in to the Junk folder. You will also be able to create a list of allowed or block messages by email address or domain. PenTeleData would like to welcome you to "My PenTeleData Webmail." Just below, we have provided a brief tutorial of the more commonly used functions of our web based e-mail system. In the event that you have a question, or trouble accessing your e-mail account using "My PenTeleData Webmail," please call our Technical Support Department and follow the menu to get Residential Technical Support. Once you have successfully logged in to "My PenTeleData Webmail" you will see the following screen. Before moving on we will take a moment to review what options are available to you on the current screen. Please review the image below for explanations on what each icon means. To view an e-mail message simply double-click on the message and it will open to a full page view of the message. When you would like to close the message, click the "Close" button. A search feature can be found at the upper right, next to your e-mail address. This tool will search all e-mail that meets the criteria you entered. From the drop down box you may also select "Contacts" or "Appointments" to expand the search fields. To search for an item, type in what you would like to search for and press Enter on your keyboard, or click on the magnifying glass icon. The results of your search will be displayed in a new window. 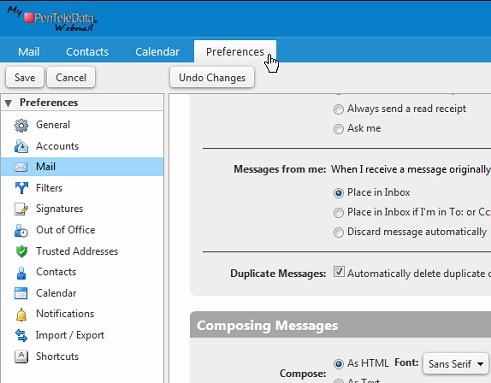 With "My PenTeleData Webmail" you can do an advanced search of e-mail, contacts, and calendar events. 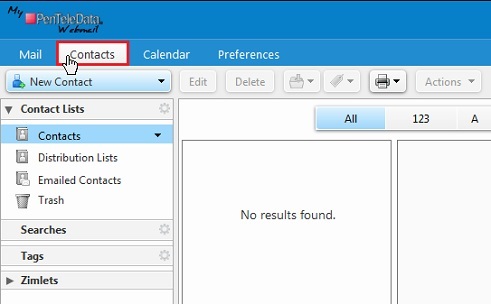 To start an advanced search, select which item you wish to search for from the drop down box (“Mail,” “Contacts,” or “Appointments”), then, without typing anything into the search field, click on the magnifying glass. On the left of the “Search” window that appears, you can select some basic filters, set advanced filters, and/or enter conditional statements into the search field. All items that meet the requirements will be shown in the results list. To close the “Search” window, click the X on the “Search” heading. 1. To begin, click the "New Message" button above the folder list. 2. 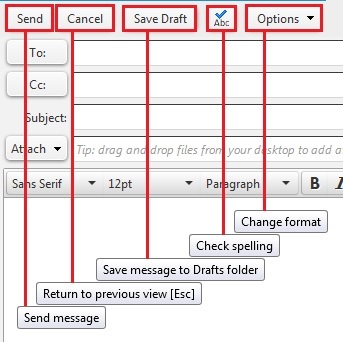 After completing your e-mail message click the "Send" button to send the e-mail. Drag and drop files from your desktop on to a message. Click on the "Attach" button. 2. From the new window browse and select the file you would like to attach. Repeat the process as necessary to add more attachments. You will also be able to attach an e-mail or a contact by clicking on the down arrow on the “Attach” button, then clicking the appropriate option. There are different ways to add someone to your contact list. The first method is to add them directly from an e-mail that you are currently viewing. You can change any fields from here. When finished click "Save." The second method is to manually create a contact. 1. To begin, click the "Contacts" heading. Before moving on we will take a moment to review what options are available to you on the current screen. Please review the image below for explanation on what each icon means. After reviewing the above image we can continue the process to manually create a contact. 2. Click the "New Contact" button from the top of the page. 3. Fill in the appropriate information in the window. Once you are finished click "Save." You have now manually created a contact. Repeat the process as necessary to create more contacts. To view existing contacts, click on the name and the information will be displayed on the right. You can also edit a contact by double-clicking on an entry. If you often send e-mail to a specific group of people, creating a contact group will allow you to add them all into one contact entry. This will eliminate the need to add each one separately to the e-mail you want to send to them. Follow the steps below to create a contact group. While in “Contacts,” hold Ctrl on your keyboard, then click each individual contact you wish to add to your group. You have now successfully created a contact group. Repeat the process as necessary to create more groups. 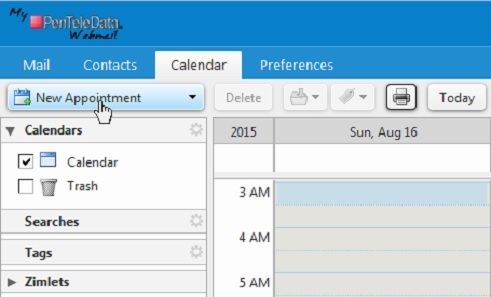 "My PenTeleData Webmail" has added a calendar feature. To access the calendar click on the "Calendar" heading. 1. To add a new event to the calendar click on the "New Appointment" button. 2. From the "Appointment" page fill in the all necessary details and set a date for the appointment. When finished click the "Save & Close" button. To delete a calendar appointment, select the appointment you wish to delete and click the "Delete" button. To begin, click the "Preferences" heading. 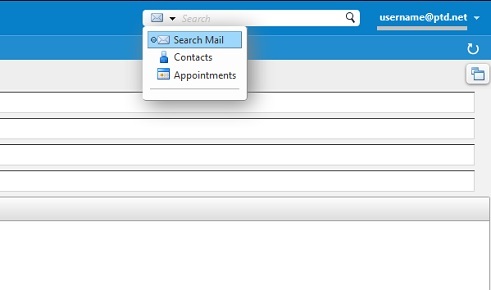 On the left you can select various categories allowing you to customize your webmail expericne. Below you will find an explanation for the settings available. Password – Changes your e-mail password. 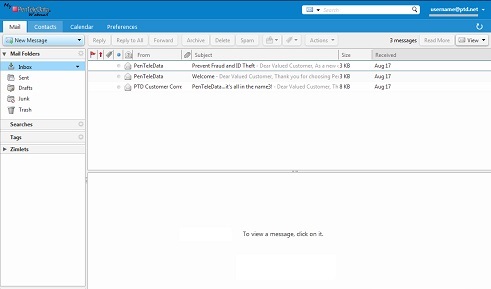 Default Client – Changes the default view of webmail. Font – Changes the font for webmail (not for composing). 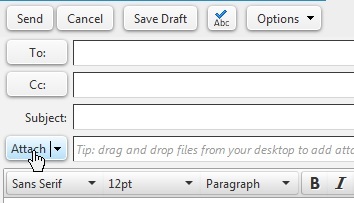 Display Font Size – Changes the font size for webmail (not for composing). Print Font Size – Changes the font size when printing from webmail. Time Zone – Changes the current time zone. Language – Changes the language that is displayed in "My PenTeleData Webmail". 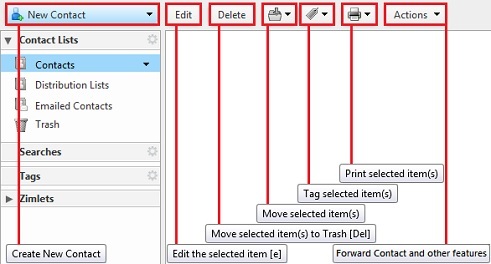 Compose Direction – Changes which direction typing occurs from. Search Folders – Changes the folders that are included in searches. Search Language – Shows advanced search language in search toolbar. Scrolling – Change the number of items fetched when scrolling. Selection – Displays check boxes to quickly select multiple items. Email Addresses – Changed whether to show names or e-mail address. Shows the account status of your e-mail account. Email address – Shows your e-mail address. Account Name – Shows the name of the current account. Settings for Sent Messages – Allows you to change the display name, add a reply-to address, what signature to use, and set delegates to the account. 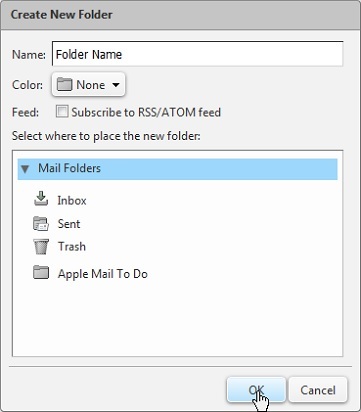 Display Mail – Changes the default view of e-mail. Message Preview – Changes how messages are previewed. Images – Changes if images are automatically shown. Reading Pane – Changes read status for messages viewed in the reading pane. Message Selection – Changes what is done after moving or deleting a message. Message Color – Changes whether color of messages and conversations are set according to tag color or not. 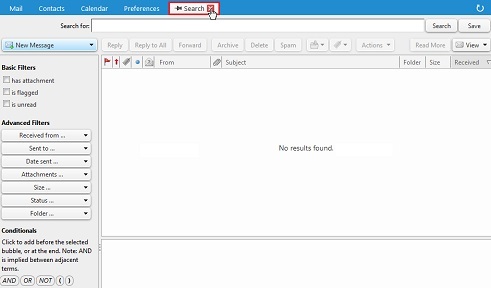 Default Mail Search – Changes where mail is searched. Message Arrival – Changes what happens when an e-mail is received, add a forwarding address, and setup notification. Read Receipt – Changes how read receipts are responded to. Messages from me – Changes how e-mails originally sent by you are handled. Duplicate Messages – Changes whether to delete duplicate message or not. Compose – Allows you to set HTML or Text as a default. Settings – Allows you to automatically save messages in the drafts, save a copy in the sent folder, and other options. Email Reply – Changes if the original message is included in the e-mail. Email Forwarding – Changes if the original message is included in the e-mail. Prefix – Changed how the original message is shown in an e-mail. Block messages from – Allows you to add up to 100 e-mail addresses or domains to block messages from. Allow messages from – Allows you to add up to 100 e-mail addresses or domains to allow messages from. Message Downloads – Allows you to set if all messages or new messages to be downloaded when using another e-mail client. Incoming Junk Messages – Allows you to set if the Junk folder is included in the message download. Incoming Deleted Messages – Changes how deleted messages are handled when downloaded. This page will allow you to create, edit, remove and run filters. 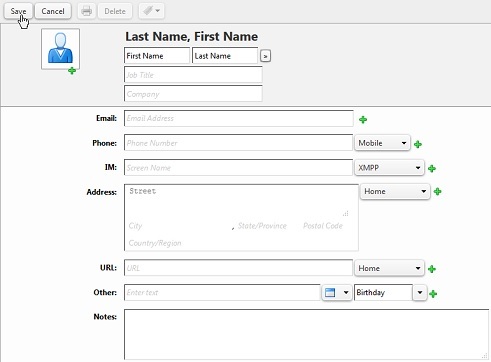 From here you will be able to create an e-mail signature in plain text or HTML. Primary Account – Set what signature to use for New messages and Replies & Forwards. Signature Placement – Sets where the signature will be placed in an e-mail. Out of Office – Turn auto-reply on or off. Auto-Reply Message – Enter the auto-reply message. Time Period – Set a specific time period to send auto-reply message. External Senders – Set a different auto-reply message for external senders. This page will allow you to set trusted addresses or domain to automatically display images from. Settings – Creates a contact for people you have sent e-mails to. Autocomplete - Allows you to set whether typing a comma will select the autocomplete match. Default View – Changes the view of the calendar. Start week on – Changes the first day of the week. Default appointment visibility – Changes who can view your appointments. Invitation Response – Will delete the invitation after it has been replied to. Forward Invites – Sets an address to forward calendar invites to. Show reminders – Sets the time on when you will be reminded about a task or invitation, and how the reminder acts. Default appointment duration – Sets the default appointment duration when creating new appointments. Work week – Set what days are considered work days. Work hours – Set what hours in a day are considered work hours. Allows changes to be made to allow "QuickAdd" when making new appointments and adding time zones. Free / Busy – Sets who can see your calendar and what they can see. Invites – Sets who can see your invites and what they can see. Notifications by E-mail – Set an address to send notifications to. From here you can select a file to import from. From here you can select what to export, saved as a GZIP file. This will show you a list of all keyboard shortcuts to use in the webmail. To empty the trash right-click on the "Trash" folder. From the menu click "Empty Trash." NOTE: The “Trash” folder is automatically emptied every 30 days. Be mindful to not keep messages you may need in the “Trash” folder, as they will eventually be removed. Additional folders can be created for organizing your messages. To create a new folder click on the gear icon labeled “Options”, then click “New Folder” on the menu that appears. Or alternatively, you may right-click on the "Inbox" then click "New Folder." You will be prompted to name your new folder. Enter the name you would like to appear. If you would like to have the new folder as a sub-folder, select the location you would like to save it to. When finished click "OK."
At the top of the "My PenTeleData Webmail" you will notice a usage bar below your e-mail address. This bar will let you know how much space you are currently using. Holding your mouse pointer over the usage bar will give you more detail on how much space you are using. Once your usage is full you will no longer be able to receive new e-mails. You will be able to sort e-mail by clicking on the column on top of the e-mail list. You may also remove columns by right-clicking on the column list and un-checking categories you no longer want to appear. Clicking on a column will sort it ascending or descending. By default e-mail is sorted by date with the newest e-mails on top. If you have any questions not answered here, please contact PenTeleData Technical Support. 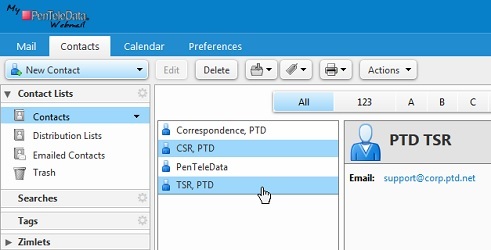 To access "My PenTeleData Webmail," point your browser to ptd.net and click "My PenTeleData Webmail" on the right side of the page. When prompted, enter your username and password. Your username will be everything before the "@" symbol in your email address. Your password will be the corresponding password for that account. Any email box that is inactive for six consecutive months will be deleted. Any email within an inactive email box is probably spam and will be automatically deleted without inspection along with the email box. Once deleted, the email address associated with the email box will be deleted and become available for assignment to other customers. An email box is inactive if it has not been checked in 6 months, does not have an email forward associated with it and is not the primary login for a dial-up account. If you intend to keep a mailbox active you may do so by retrieving email from within the email box at least once every 6 months . PenTeleData is not responsible for any loss of any kind because of the deletion of boxes or the email inside. If your email box is deleted for inactivity, you may contact Customer Service to have the email box reinstated if the email address is still available. 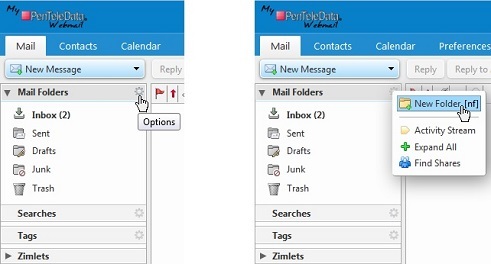 Yes, you still have the ability to send and receive attachments with "My PenTeleData Webmail." Attachments are still limited to a maximum size of 8 MB (megabytes). Dial-up customers may experience difficulty with sending attachments larger than 2 MB due to the speed at which attachments are sent via a dial-up connection. Please keep in mind that it will take longer for the recipient to receive the message than it took you to send it. Large attachments can fill the recipient’s mailbox or cause the mailbox to lock up, preventing the recipient from receiving any other email.